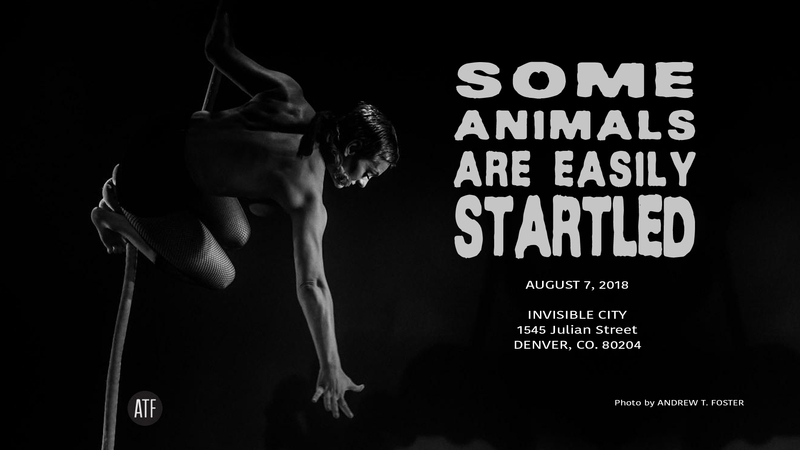 Rainbow Militia and Invisible City are thrilled to host Lisa Natoli for a performance of her new show “Some Animals are Easily Startled,” a staged reading of a solo involving other people. An artist talk back will follow the performance. This evening questions what is it to make and view work in the current social climate, with all the baggage we carry. Lisa’s work is subtle with a raw sense of humor and a volatile sense of being. Lisa is returning to Denver after spending over a year in Minneapolis where she was head aerial instructor at ExperTease Fitness and performed with Black Hearts Burlesque and Elektra Cute Presents and at The Minnsky Theater. She will be retuning to MSP in October to present a collaborative rope piece with Elizabeth Munn at The Minneapolis Burlesque Festival. Lisa worked with Spiegelworld and Steven Hoggett at St. Ann’s Warehouse in Brooklyn (2017), Drumming: A Group Hallucination at House of Yes (2017) and has been presenting solo and ensemble work in NYC for over 10 years and is a regular performer in the NYC cabaret scene making appearances at the Slipper Room, Galapagos Art Space, Coney Island USA, House of Yes, and Dixon Place. Suggested Donation of $20 at the door, no one turned away. Photo credit Andrew T. Foster NYC. This entry was posted in Uncategorized and tagged #denveraerialist, #invisiblecity, #ironfanny, #LisaNatoli, #rainbowmilitia. Bookmark the permalink.